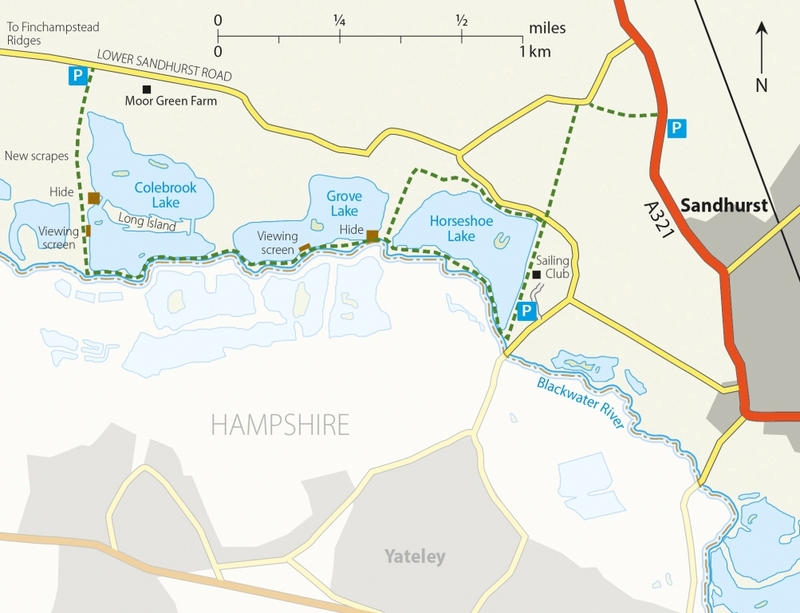 Following half a century of gravel extraction in the Blackwater valley around Eversley on the Berkshire/Hampshire border, a nature reserve was created around Colebrook and Grove Lakes, each of which has a viewing hide. A large extension to the reserve (not shown) is being constructed to the west of Colebrook Lake, comprising pools, scrapes and reedbeds. A footpatth along the River Blackwater west from Colebrook Lake overlooks the new wetland area. The reserve is managed by the Moor Green Lakes Group, whose website provides more information. Access: At the western end, there is a small car park off Lower Sandhurst Road (SU 805 628), and at the eastern end, the Activity Centre car-park off Mill Lane (SU 821 620). Please check the Moor Green Lakes Group website and signs on site for closing times of car parks. Resident: Little and Great Crested Grebes, Little Egret, feral Barnacle and Snow Geese, Egyptian Goose, Sparrowhawk, Buzzard are often overhead, Lapwing, Snipe, Barn and Little Owl, Kingfisher, possible Lesser Spotted Woodpecker, Stonechat, Linnet, Reed Bunting, Bullfinch, Yellowhammer. Summer visitors: Little Ringed Plover, Black-headed Gulls and Common Terns breeding. Hobby often present. Most common warblers. Winter: Goosander, Goldeneye, Smew, Brambling, sometimes Short-eared Owl. Spring/Autumn passage: Garganey, Osprey and Marsh Harrier most years, Common, Green and sometimes Wood Sandpipers, Dunlin, Greenshank, Black-tailed Godwit, Yellow Wagtail, Cuckoo. occasional Turtle Dove. Rarer visitors: Shorelark (1998), Lesser Yellowlegs (2001), Pectoral Sandpiper (2003), Whiskered Tern (2005), Ring-necked Duck (2006), Red-footed Falcon (2006 and 2007) and Pallas’s Warbler (2012/3).